Keyo Is steeped in historical significance, and it's no accident that the name and culture have survived. 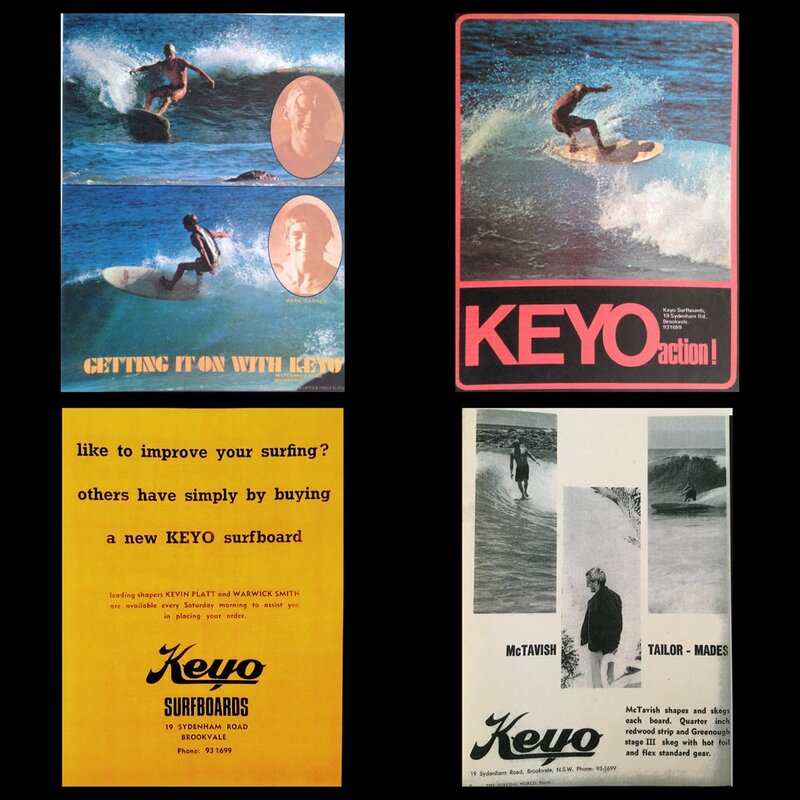 In 1957 a young Denny Keogh started shaping surfboards from a garage, and officially opened the Keyo Surfboard factory and retail shop in the Northern Beaches suburb of Brookvale, Sydney in 1959. A neighbourhood that quickly became the countries surfboard manufacturing hub. Midget Farrelley, winner of the 1962 Makaha international, was the first surfboard shaper brought in to help with the workload. Denny in fact shaped the board that Midget rode to victory in the first World Surfing Championships, held at Manly Beach in 1964. Bob McTavish joined Keyo in 1967 where he shaped his Vee-bottoms, wide backed nine footers which in part kicked off the short board revolution. The McTavish designed Keyo Plastic Machine Vee bottom models were soon selling at the astonishing rate of 70 a week. In 1968 Nat Young came on board and with his high profile they produced another popular model, the Tracker. Later that year the Keyo factory burnt to the ground, but was quickly re-opened in the premises behind the gutted factory. Other high profile shapers to work under the Keyo label were guys like Kevin Platt, Neil Purchase, Geoff Mc Coy, Col Smith, Phil Cooper and Mickey Mac. In 1972 Denny acquired the Hobie Cat franchise and began building the catamarans. By 1974 the production of Keyo surfboards stopped giving way to the high demand of the popular Hobie Cat. In the mid 90's Johnny Gill married Denny's daughter Vanessa, since then he has been producing boards under the Keyo label. He has a respected following and Keyo Surfboards are once again in demand.